What’s Wrong with the Blood and Sand Cocktail? I wouldn’t normally write about the Blood and Sand Cocktail. I don’t like it. I’ve never met anyone who likes it. The flavors make no sense to me. Four ingredients, all fighting with each other. Harry Craddock must have seen something in it when he first published its peculiar formula in his 1930 Savoy Cocktail Book . And drinkers with palates different from mine must like it, as evidenced by its continued presence in highly respected bar manuals more than eighty years after its creation. But from my palate’s point of view, the Blood and Sand is really broken. So what makes this cocktail worth writing about? Clearly, for many of us, this one is a matter of taste. It’s worth trying once, and if you like it, then that’s a big win. For me, the Blood and Sand’s real value isn’t as a cocktail, but as a model. The original formula makes a great jumping-off point for experimentation; there’s always something to be learned. And maybe some really good drinks along the way. It’s not clear if Harry Craddock invented this cocktail, or if he was just the first to publish it. It is a peculiar collection of ingredients. I probably would never have taken an interest in such a mix if it weren’t for that famous name. Craddock, as usual, gives no guidance about what the drink should taste like. The style of Scotch or of vermouth you choose can alter the drink dramatically. And then there’s the orange juice, a difficult ingredient at best. It’s a natural for rum drinks—I’m looking at you, Hurricane—but it can be a prickly customer with whiskies of any kind. That is exactly the question that barmen and drinkers have faced through the years as they tried to make this putative classic into something actually drinkable. And it turns out that experimentation has provided some important insights. If you look through your bar manuals or do a search for Blood and Sand, you’re likely to find that every ingredient has been substituted over time, proportions tinkered with, and new ingredients added, in efforts to improve the drink. I’ve encountered two strategies that seem to work particularly well. The first is to swap out the sweet vermouth for a decent port wine. The resulting drink is a bit less herbal, and a bit more earthy, than the original, an alteration that seems to go particularly well with the Scotch. The second strategy is to focus on smoky spirits. The flavors seem to blend better, and the orange juice in particular becomes much more compatible with the rest of the formula. The most successful choices are smoky mezcals and the assertive, peaty Islay Scotches like Laphroaig. With that in mind, here are two variants that rehabilitate the original Blood and Sand, not just to drinkability, but to a desirable level of success. Rather than attempting fancy names, I’m just going to number them. Blood and Sand #2: Both of these variants substitute port for the sweet vermouth. Blood and Sand #2 amps up the Scotch, using one of Islay’s smokiest whiskies, and cuts back the proportions of the sweet and sour elements. Shake all ingredients with ice until cold; strain into a chilled cocktail glass. No garnish. 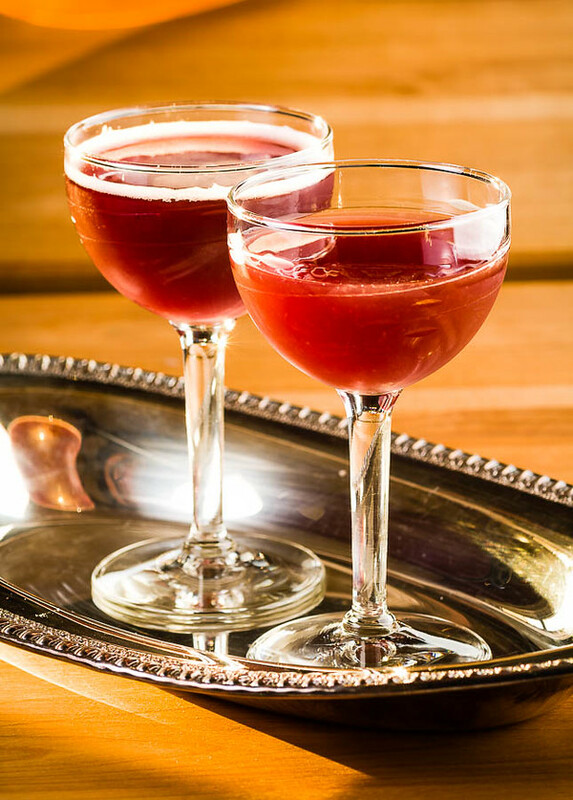 Cherry Heering is the near-universal standard ingredient for drinks that call for cherry brandy, and is the classic choice for Blood and Sand. Blood and Sand #2 cuts back on the Heering and the orange juice, and lets Scotch and port carry the load, which they do very compatibly. There is just enough orange juice to add a balancing bright note for the smokiness of the whiskey. The Cherry Heering is the main offsetting sweetener here, with some help from the port. Blood and Sand #2 has a fine, smoky nose, a solid, peaty whisky entry on the palate, a gradual sweetening, and finally a little flash of orange citrus on the swallow. Blood and Sand #3: One of the current trends in Blood and Sand experiments is to substitute smoky mezcal for the Scotch component. Blood and Sand #3 is one expression of that concept. Shake all ingredients with ice until cold. Strain the drink into the cocktail glass. No garnish. This is a very different cocktail from the #2; it is lighter-bodied and less assertive, and more eager to absorb the orange juice. It seems summery, almost airy, compared to the heft and peatiness of the Laphroaig. The proportions are different in this version—mezcal seems much more friendly toward orange than toward the port wine, so the amounts of those two ingredients are switched in Blood and Sand #3. Overall, the mezcal’s light smokiness is just enough to help blend the underlying flavors. Its mild smoke and agave grassiness dominate the nose and the initial impression on the palate, then blend with the fruit flavors to make a very harmonious whole. The orange shows up in the swallow, then fades, leaving just the long, dry taste of the mezcal. So back to the original question: what’s wrong with the Blood and Sand? Maybe it’s a question of genetics, and I’ll just never be able to taste it right. Or maybe my palate isn’t well-enough educated to appreciate it. Or maybe it’s just a junk cocktail. In the end, I don’t think my palate will evolve in a way that makes the original Blood and Sand a drinkable cocktail, no matter how sophisticated I wish to be. I do know that I just don’t like that thing, and that’s the way it will be. But I’ve come to an appreciation of the design that I have never had before: Blood and Sand as a template, or as a jumping-off point in cocktail design. It led to some fun discoveries. 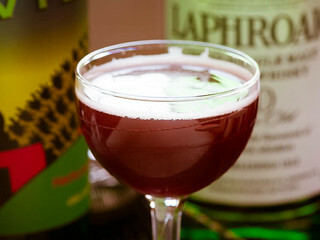 I really like that heavy, Laphroaig and port Blood and Sand #2 on a wintry afternoon, and it may join my regular cold weather cocktail rotation. Perhaps the same will happen with the lighter mezcal version when summer rolls around. “What’s Wrong with the Blood and Sand Cocktail?” at cold-glass.com : All text and photos © 2016 Douglas M. Ford. All rights reserved. This post is quite the coincidence, as I just tried this drink for the first time a couple days ago based on a friend recommendation. I used a recipe from Death & Co which is more scotch heavy than the original, uses their common Dolin/Punt Y Mes mix of vermouth, and adds a touch of lemon juice. It was very tasty! I’ve seen that recipe, never made it. I wonder if subbing a bit of lemon for the orange is part of the solution? I guess I’ll have to find out. Thanks for the reminder! intriguing. I’ve been putting off buying cherry heering but I may have to break down and get some to try these two. While I was reading the first half of the post I had something like dejavu. A weird cocktail with plain 1:1:1:1 proportion and all of the ingredients “fighting with each other” but as for me it’s not Blood & Sand… Rather Last Word 8) I’ve never thought about similarity of these cocktails, have you? I’m with you. I’ve never been able to stomach the Blood and Sand, and by now I think it may have ruined me for any drink containing Cherry Heering liqueur. That syrupy liqueur is so sickly, and it just ruins the scotch, to my taste…Add sweet vermouth, and the slight sweetness of orange juice, and God forbid, a richer inland scotch like Highland Park 18, and the whole drink is just a rotten, cloying mess. Maybe your versions could change my mind, but for now, I’d rather just sip the Laphroaig on my shelf. It would be interesting to try this with a real cherry brandy (as opposed to a liqueur), as originally specified, but there seems to be no such thing, at least not in my liquor stores. Alas! that there are so few properly-made non-grape brandies to cocktail with. I know what you mean. Death and Co recommends a variety of Eaux-de-Vies, particularly by Massenez, but even the website that they recommend for alcohol supply, astorwines, never seems to have them in stock. And to compound the problem for me, I live in Michigan, where any and all liquor must be on the approved price book published by the Liquor Control Board, and for a certain minimum price. What it really does is keep liquor sales firmly in the control of whichever giant companies can pay for lobbyists. So we have a thousand different flavored Bacardi abominations on the shelves, but nothing by Rothman and Winter. I’m sure many folks read this discussion and just figured they could go get a bottle of Tropicana and use that…BLASPHEMY! I think that using fresh-juiced oranges would really help this cocktail…and my spidey sense is tingling at the thought of using blood oranges. I’m with you, it has to be fresh juice. And as it happens, I did use blood oranges on the day I made the photos. They definitely bring a lot of (red) color into the drink, and they have that little bit of a berry overtone in the flavor, though that nuance is pretty much subdued by the other flavors in the drink. Thanks for taking time to add the “fresh juice” reminder! I made pitchers of Manhattans, Hemingway Daiquiris, and Blood & Sand for a dinner party. The Blood & Sand was a hit. We always build in the glass and serve on rocks. Served up it is indeed a weird drink. Come to think of it, I’ve never served Blood and Sand on the rocks. I’ll try that next time. Thanks. Here’s the thing. This cocktail may have its standards, but if you are making it at home add more or less to what makes the cocktail taste great for you. Have a sweet palate? Add more OJ and/or sweet vermouth. Prefer the dried fruit/smokey taste of scotch? You can either add more OR even better experiment with different scotch. Smokey flavor Laphroaig 10 yr or even more smoke Laphroaig Triple wood, EVEN MORE smoke Bruichladdich Octomore or Black Art. Want just a hint of smoke on the nose lace the glass with Highland Park 12yr or something like Springbank from Campbeltown. Get creative guys! This cocktail is amazing, if you call this cocktail at any established cocktail bar you should not be disappointed. I made it with Glenmorangie Original, Dolin Rouge, Cherry Heering and fresh OJ, and I thought it was a fine cocktail. That was with the traditional 1:1:1:1 ratios.